Last summer you couldn’t swing a deconstructed avocado toast in a Melbourne bar without hitting a frosty pink glass of frosé. But this year the drink of the season is fast shaping up to be gin and the Auburn Hotel is hopping right on that train. 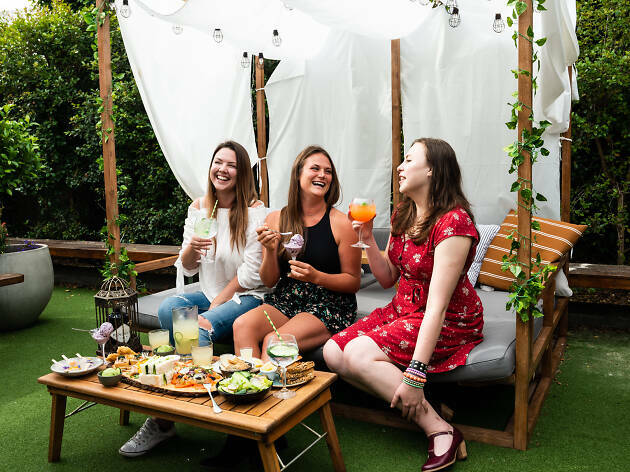 The pub is transforming its beer garden into ‘Hendricks botanical garden’ for the summer season, kitting the space out with daybeds and serving a bunch of gin-infused treats plus drinks. 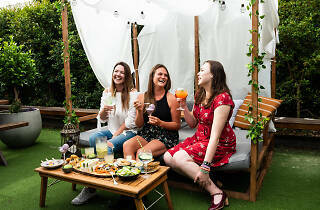 If you want the complete experience book a “GinBrella” package where you and a pal will get your own daybed to lounge on, a seafood platter, two Hendricks gin cocktails or gin cocktail jug plus a dessert. Speaking of dessert – the Auburn is churning out gin-infused ice cream, sorbet and icy poles as part of their summer of gin. Yep, it’s hard to imagine how ice cream could be improved but the team at the Auburn have managed to do it. Try their blueberry and gin ice cream, gin sorbet or the cute-as-a-button gin and lemonade icy poles (they’ve frozen real flowers into them). If you don’t want to go in for the whole shebang you can still get gin cocktails individually from the bar or grab a G&T and salmon gravlax combo for $22. Hendricks Gin Garden is on at Auburn Hotel from now until February. You've had boozy bottomless brunch, now try boozy bottomless punch. Gelato appreciation courses are back at Gelato Messina.